Alaska Marine Lines helped transport a wind turbine to Sitka’s Mt. Edgecumbe School as part of a U.S. Department of Energy program to raise awareness of wind energy in rural communities. The Wind for Schools Program introduces wind energy to small towns and engages rural teachers and students in its benefits. Sitka was the second school in Alaska to install a turbine through the program which is coordinated by Alaska’s Renewable Energy Alaska Project and the Alaska Center for Energy & Power at the University of Alaska Fairbanks. 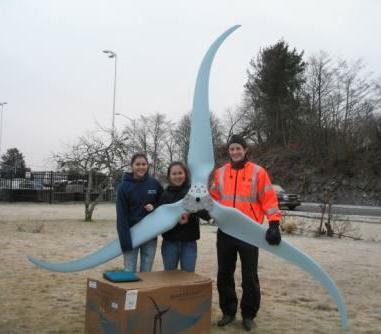 Students and teacher hold the turbine blades at Mt. Edgecumbe School in Sitka, AK. When Alaska Marine Lines Vice President Dave Curtis heard about the program, he thought the Seattle-to-Sitka barge could be put to use assisting the school. After some coordination, the following oversize pieces rode the Alaska Marine Lines barge for the project’s Skystream Turbine: a 200-pound pallet box, foundation kit, miscellaneous parts weighing approximately 500 pounds and a 60-foot monopole weighing 865 pounds. The turbine was constructed and installed at the school in December. Twelve more communities throughout Alaska are raising funds to install a wind turbine at their school. Lynden Transport, Alaska Marine Lines, Alaska Hovercraft and Lynden Air Cargo have offered to provide in-kind assistance to transport the turbines and towers. The companies will help in the next few years as these communities raise the remaining funds they need. Each school applies to participate in the program to install a wind turbine at the campus. The turbine then provides electricity to the school, but primarily acts as an educational tool for the students to learn about energy and electricity using an established curriculum.